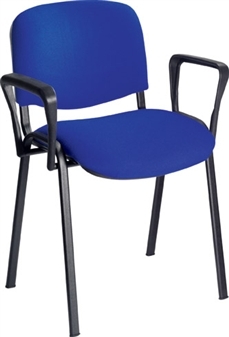 Next day delivery fabric stacking chair with black or chrome frame and fixed arms, suitable for reception areas, conference rooms, the meeting room, etc.. and available in a choice of Royal blue, claret or charcoal fabric. Ideal seating for the school classroom, lecture room, office, training room, hospital, waiting room, public sector etc.. A multi-purpose chair available at short notice with next day delivery. Minimum order 4 chairs. Ideal For Schools, Hospitals, Offices Etc..